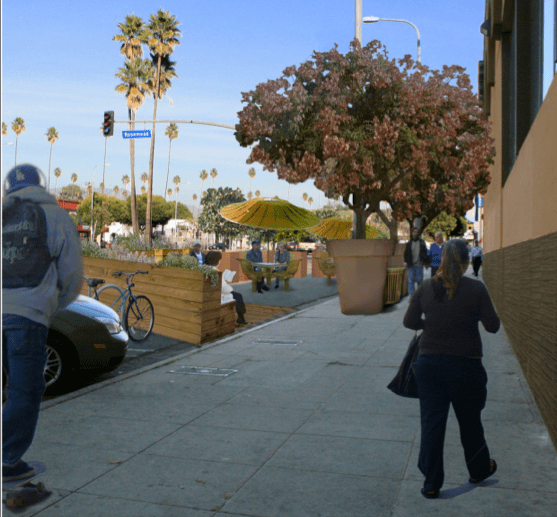 Huizar, Living Streets, Unveil Parklet Designs for El Sereno Street, York Blvd. Proposed York Boulevard Street Porch, Highland Park. Click on the image for a high resolution pdf of the image. The El Sereno Street Plaza. Click on the image for a high resolution pdf of the image. Unlike the temporary plaza at the Sunset Triangle Plaza, the furniture for the porch and for the plaza are more permanent, 24-hour furniture. Sometimes, new mini-open space projects such as the Triangle Plaza and the new parklets in Long Beach can feel as though they are extensions of outdoor seating for restaurants and cafes. In both El Sereno and York Boulevard, the new street structures will not be built outside of a restaurant. The Office of Councilman Jose Huizar notes that these projects are part of a District-wide effort to improve the state and nature of L.A.’s streets. Spokesman Rick Coca points to the green bike lane providing alternatives for visitors to the 1st Street Arts District in Boyle Heights, the city’s first bike corral in front of Cafe de Leche, and the “Bringing Broadway Back” plans for a streetcar and new pedestrian areas as other examples of Huizar’s commitment to a new way of looking at transportation. “I am working on improving major corridors in every part of my district. A big part of those improvements is a philosophy that puts people ahead of cars – I want to see more pedestrian uses, more bicycle uses. And communities from throughout my district agree,” Huizar adds. “There is a desire for more local, public interaction, local shopping, local dining, but in a manner that allows people to leave their cars at home. That’s a major component to my Bringing Back Broadway initiative Downtown and my work to support the burgeoning Arts District on First Street in Boyle Heights. I brought in the Green L.A. Living Streets team to work with my staff and community members on improvement plans for York Boulevard in Highland Park and Huntington Drive in El Sereno.” In 2010, the Council office earned grant funds for new planning efforts on York Boulevard and El Sereno Street. Rather than engage in a typical planning process, Huizar teamed with Living Streets and Cancian Rasmussen. This led to an aggressive 22 meeting schedule which saw the community push for a small slice of open space on these underutilized boulevards. On York Boulevard, the street porch will be located on the shady side of the street on the most active block of York Boulevard. The community developed an organic design featuring inset tile mosaic and river rocks. The design alludes to the history and natural environment of Highland Park and honors and engages the area’s emerging creative community. For El Sereno Street, the community chose a spot in its downtown business district adjacent to a busy Food 4 Less store, the local hardware store and across the street from the Barrio Action Youth & Family Center. The extra wide parking area adjacent to six-lane-wide Huntington Drive creates a safety and sound buffer and the busy pedestrian activity ensure that the plaza will be used by many people. Residents also specifically decided to choose a location not adjacent to a restaurant or café to be sure the space would be seen as 100% public. With funding for construction already identified, the city is just waiting on itself before moving to construction. The biggest holdup is that the plans for these streets is so new for Los Angeles that the city isn’t sure how to permit them. “The city’s never done anything like this,” explains Lehman. “The city wants to be sure they do everything they need to do so the porch and the plaza can stay.” Unlike the Sunset Triangle Plaza, the El Sereno Street Plaza and the York Boulevard Street Porch construction will be by the community, not LADOT or consultants. Confused how to permit such a project, the Bureau of Engineering asked the City Council to pass a new motion with guidelines for plaza/porch construction. The Council directed city staff to draft such an ordinance, but at the time of publication the city hasn’t announced a hearing schedule to move the motion. But with these sketches in hand, when the city is ready to move, the community will be waiting. The Council office continues to hope that constrcution could be completed by the end of the next calendar year. If worthless drivers can slam their cars into storefronts, they sure as hell can slam into a “street porch”. They can slam into other cars too! The results are in, lets convert every square inch into a parking space! For El Sereno – that seems to be the local hangout for homeless people or those who like to visit the liquor store (right next to Food For Less) often- has anything been put in place to keep them from using this area as their own personal lounge area? I like the “street porch”. It’s like Parking Day LA, except permanent! think we focus too much on being creative rather than being practical. Do they pay people to sit around and think of stupid ways to waste money??? They are doing that right now! Mandog: maybe you should move out there to the arid western states. It seems like their values match yours: Cars. Here’s the plan. The residents of Southern California will work hard to ensure they have nice public spaces and quality of life–ultimately being able to take the time to sit on the side of the road if they so desire. The residents of Arizona, Utah, and New Mexico can watch their pavement dry as cars go faster and faster through their neighborhoods. They hate their neighborhoods so much that they keep working harder and harder to move into a nicer one. Perhaps one with gates to keep all those short-cutting, out of control cars out. The road is for people. and yet in CD 14, we just got a sidewalk torn up and replaced w/asphalt, no help from Huizar’s office…oh yes, get your own A permit, and look up a contractor on Yelp. seriously. Whole block was torn up, because the city wanted to take down one tree. That’s the point, drunks and drug dealers hang out in dirty empty avoided places. Positive activity in this spot bumps them out either on their own accord or because community members take a more active role in pushing them out in order to maintain this public space. Quiet avoidance of a problem is not a solution. The City of LA is 30 years behind in its road maintenance, to the tune of several billions of dollars. Streets like York Boulevard are part of the problem: an over reliance on the automobile has made this neighborhood unable to pay for its own maintenance because of low property values (low property taxes collected) and low retail prospects (low sales and business taxes collected). By installing small park-like amenities, the hope is to “revitalize” this heavily invested in corridor, to make it more able to pay its own way. This park re-aligns the space to signal that this is a street where automobiles are not the dominant form of transportation, where cars are no the only thing that matter, and that the local quality of life (noise, access to amenities, safety from car crashes) is improved. If York can be made to more fully pay its own way, the same can be done all over Los Angeles, and our maintenance burden can be lessened. I like the concept of these parklets but the one for Highland Park looks like its designed for cave people. I personally think its pretty terrible looking…. Totally awesome. We need these all over town. I would so much rather see funds going towards planting more street trees. If there was more shade along that corridor people would be much more inclined to walk. I think this is a great idea, but the one in York Blvd, should have some trees. It looks kind of plain. I like the one in El Sereno better. I am looking forward to seeing the El Sereno street plaza finished. Please make sure to have waste baskets available and to maintain the cleaning so the place does not become a dump. There was word that “Food 4 Less” was going to add a entrance on Huntington Drive side. But the construction does not reflect a entrance. With the Plaza planned to be in front of “Food 4 Less” a entrance would only make sense. Their was also word that “Food 4 Less” was given public funds for there remodel, If this the case the community should have a say on the construction. 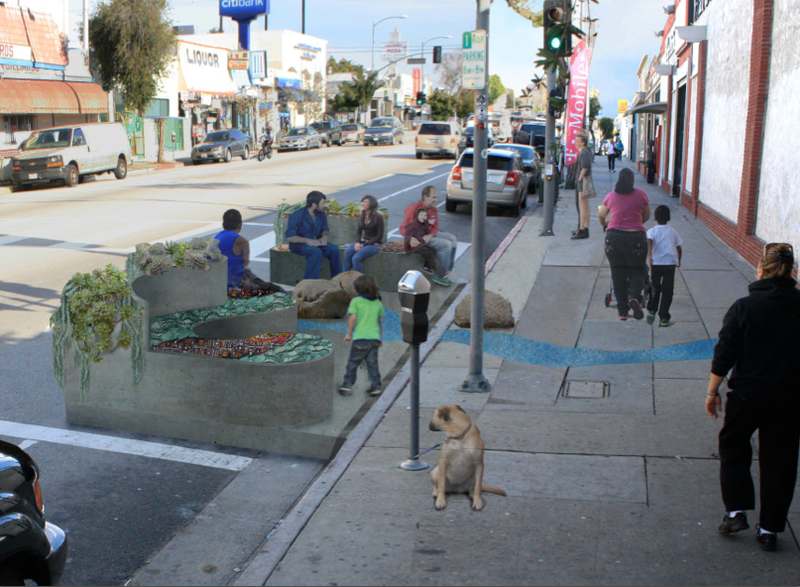 L.A.s parklets WILL fail the way that they are being implemented. On the top image you can see that the “porch” (parklet) faces a blank wall of a building. ALL urbanists will tell you blank building walls kills off pedestrians. That’s why EVERY successful business district is one where the blocks are filled with stores open to the street for the length of the district. In San Francisco, New York City, Philadelphia, Vancouver, the parklets have been overwhelmingly successful because persons are walking up and down the business district and/or they will go to the business that is in front of the parklet and then exit the business in front of the parklet and sit down/plant themselves on/in the parklet. Los Angeles simply doesn’t understand what’s propelling contemporary urbanism. They put their parklet in front of a blank wall and no one – NONE – will use it and it will just be unutilized to where the homeless will take it over. TAKE NOTE LOS ANGELES: study and learn why parklets in SF, NYC, Philadelphia, Vancouver, etc. are successful…… they way you are going to implement your parklets in front of blank walls GUARANTEES FAILURE OF YOUR PARKLETS.